Innovation gradient color cube bluetooth speaker with magic LED flashing light, which made the sound more natural and delicate with its high-fidelity speakers. You can have a party at home, all your friends will like its amazing LED flashing light . 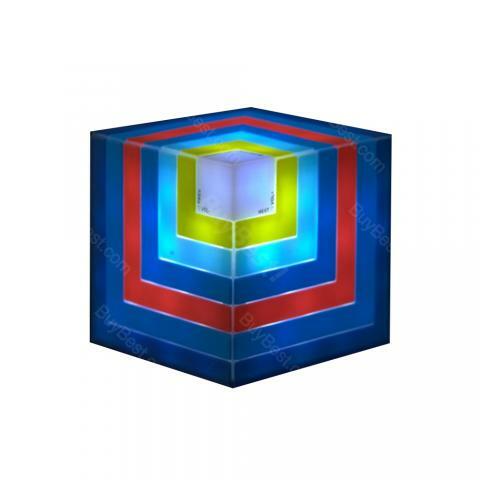 Innovation gradient color cube bluetooth speaker with magic LED flashing light, which made the sound more natural and delicate with its high-fidelity speakers. You can have a party at home, all your friends will like its amazing LED flashing light and quality music sound. • Come with 75 LED lights, extra bright shown on 4 sides with changable flashing light. • Featured with high quality powerful 40mm speaker, it will bring you. • clear and deep bass sound effect. • Built-in 600mA rechargeable battery, can up to at least 4 hours music playtime. • Portable mini size and magic cube design, featured its ideal gifts to your kids, girlfriend, or other families. • Equipped bluetooth 4.0 technology, it can pair to most bluetooth devices, includes iPhones, Android phones, iPads and other tablets, laptop and desktop computers, game consoles, etc. • Support calls hands-free function with built-in microphone. • Can not only use as a night lamp. The sound quality is pleasing. these are amazing sound quality is amazing recommended. Fast charge, easy to connect with my galaxy. I work nights so listen to musuc all night, Battery lasts entire night. Very comfortable to wear! Sometimes I forget they're still around my neck. Love them! Recommend them highly! Charging quickly and the battery can sustain long time's use. Recommend this cube speaker for parties. It brings much fun for friends gathering. The sound and loudness are both great. The salesmen solved my questions quickly and professionally. Thank you. This is my third order of this led speaker. Kids really love this kind of colorful device. They have lots of fun with it.